Free web hosting has become increasingly popular over the past few years, and I for sure can see why. Running a website can be expensive, let alone running a business. Cutting costs can often be essential in ensuring you can stay afloat. So, if you can get free hosting, why wouldn’t you? The trouble I’ve found is that a lot of the advertised free web hosting isn’t exactly free. There’s often restrictions and limitations on storage, data, bandwidth, etc. and the web hosts themselves aren’t much to shout about. Personally, I would avoid free hosting altogether. In terms of alternatives, I would suggest you pay a bit extra and choose a hosting company such as SiteGround or Hostinger. Like with many things in life, you get what you pay for and hosting is no different. Hostinger was founded in 2004 and have grown to almost 30 million registered users across the globe. Although Hostinger isn’t technically free, plans start from a mere £0.80 per month, which is why they deserve a spot here. Hostinger prides itself on it’s ultra fast WordPress website speed. Their servers are IPv6 enabled, with PHP7, and NGINX caching. Their focus on speed and performance means your website visitors are only going to increase, and won’t abandon your site because it’s too slow! When I tested their response time and uptime history in my Hostinger review, I was really impressed with the results. Although they only guarantee a 99.9% uptime, they always deliver on this. Their free web hosting features are a force to be reckoned with, including a free SSL certificate, free domain registration, and more with their Premium and Business plans. x10Hosting has over 10 years of experience as a free web hosting service. They boast their ‘full web hosting suite’ which endevours to give you everything you need to host your website. With x10Hosting’s free plan, you’ll get unlimited bandwidth, unlimited storage, PHP, MySQL, cPanel, and 1-click installations. Pretty much all you need to get started with web hosting! This free web host provides some pretty great uptimes, meaning your website will be online for the majority of it’s lifespan. Their loading speeds and server response times are also admirable, given that their services are free. And the fact that you get unlimited bandwidth and storage is another strong talking point. However, like many free web hosts, their unlimited promises are a little questionable. x10Hosting have the right to suspend your website if your usage is ‘too high’. What ‘too high’ is, though, isn’t specified anywhere, so it’s hard to know what this means! Much like other free web hosting services, x10Hosting also have a premium package if you’re looking for something extra. With a 99.9% uptime guarantee, free website builder, automatic backups, and SEO tools, monthly costs start at $6.95 per month. The longer you sign up for, the cheaper the premium plan becomes. AwardSpace provide web hosting for over 2.5 million customers. They’ve been in the web hosting business for over 15 years, so have a lot of experience as a free web hosting service. They offer a 99+% uptime guarantee, 24/7 customer support, an average response time of 15 minutes, and a 30-day money-back guarantee. These features are quite appealing considering they’re a free web hosting provider. AwardSpace’s plans include MySQL database, one-click installations, and much more. 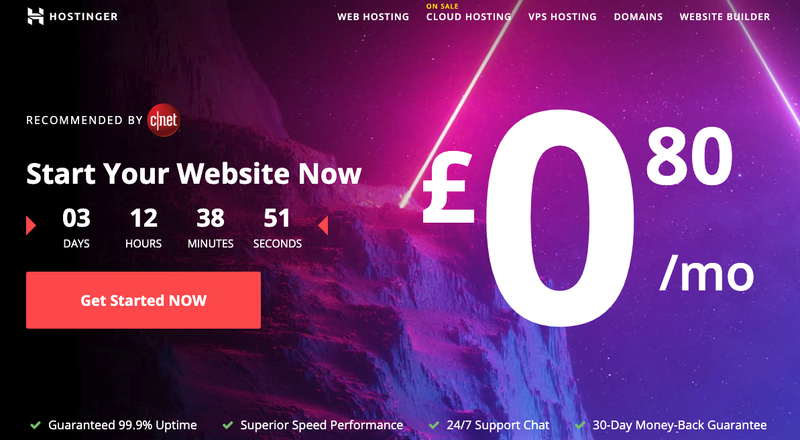 You can host up to 4 websites with this free web host, and they’re 100% advert free. Rest assured, you can create a professional website and host it absolutely free with AwardSpace, without annoying adverts or a lack of features. There are many good aspects that AwardSpace features. However, if you’re looking for a long-term web hosting solution with unlimited bandwidth and storage, then you may need to upgrade to another web host. AwardSpace’s free web hosting only comes with 1GB of disk space and 5GB bandwidth. There’s a good chance you could reach those limits within a short space of time. This web host’s free web hosting solution is more of a taster to their premium plans. If you do find that their free plan doesn’t offer quite enough, their paid plans start at €2.79 per month. If you’re only interested in creating a personal website, or a blog, then their free plan could be the ideal free solution for you. FreeDomain.co.nr and AttractSoft GmbH have joined together to create FreeHostingEU. They offer two paid hosting plans and a free web hosting service. The free web hosting package offers 200MB of disk space, 4GB bandwidth, and 1 email account. You’ll also have 5 free domains included from eu5.net, but to be honest, I can’t see these being used that much. Users can enjoy access to 3 free website builders, as well as 1-click installations for WordPress, Joomla, etc. PHP, MySQL, CGI, and other languages are supported, making this free plan just as professional as a paid plan. However, if you’re looking for some user support, you may be disappointed to find out that their support forums have been closed. FreeHostingEU provide a limited free plan for users who are happy with what’s on offer. However, if you’re looking for something more, their low cost web hosting solutions start from $4.95 per month and claim to be 70% faster than the free plan. Web hosting space and bandwidth are increased to unlimited, as well as more email accounts and an antivirus included for free. In terms of customer support, this free web host provide 24/7 support via live chat, ticket system, and their FAQ’s. They’re also seemingly active on social media via their Facebook page. FreeHosting.com have over 15,000 customers and almost 10 years in the free hosting business. As a European host, FreeHosting.com have become increasingly popular over the past few years, offering free web hosting to the masses. FreeHosting.com offer free web hosting services, paid services, and domain registration (like many of it’s competitors). If you already have a domain, you can attach it to your free web hosting plan. Alternatively, you can use FreeHosting.com’s domain services to purchase a new one. Users will be offered unmetered bandwidth, cPanel, 10GB disk space, 1 email account, and 1 MySQL database. In terms of a free web hosting service, FreeHosting.com certainly offer enough to get a personal, blog, or small business website up and running. However, in this web host’s case, not everything is as good as it seems. Website’s hosted with FreeHosting.com were recording very slow loading times around 2 seconds, and very poor uptime records. If you’re not fussed about generating traffic to your website, and you just need a free web host to physically host your website, then this may not bother you. However, for most, this would be off putting. Although Wix is a website builder as it’s main focus, it also provides web hosting for free. This drag and drop website builder offers a free plan for users who are keen to create their own website at a low cost. You won’t need any coding skills to get started, and you’ll get 500MB storage, 500MB bandwidth, a free email account, and a free Wix.com subdomain. One of the main appeals of Wix as a free web hosting and website builder service is how user friendly it is. Whether you’ve created a website before (or not), or hosted a website, Wix makes the whole process really easy. Simply choose a category to get started and you can browse hundreds of beautiful themes and templates to edit to your liking. There’s plenty of tools to use too, such as SEO, which can be configured to speed up your website. Although it’s not a web host (more so a website builder that hosts your website), it still offers enough for most users. However, it’s free plan may not be the best option if you’re looking for a professional website. Now, the reason I say this is really only based on it’s disk space and bandwidth limitations. You’ll be able to host a basic website, but if you want to host a business website or splash out on images and videos, you’ll need to upgrade to one of their paid plans. Similarly, if you want your own domain name that doesn’t have Wix.com included in it, you’re going to have to pay for a premium account. WordPress is probably one of the most popular or well known brands in terms of website creation. WordPress.org is the open-source version of WordPress that requires a separate web host to the website builder. However, WordPress.com is a website builder that will host your website for you (for free). Although WordPress is very popular, it may not be the best option for beginners. It doesn’t have drag and drop features like Wix and Weebly, however, it’s much more powerful. There’s tonnes of customisation options and thousands of templates to choose from, allowing you to create a professional website with it’s own web hosting. WordPress.com customers will get 3GB storage, 3GB bandwidth, an email account, access to lots of themes, and a WordPress.com subdomain. For this reason, it may be a good starter option for users who are keen bloggers as opposed to small businesses. If you do want to upgrade though, you can pay as little as $4 per month. This will open up more themes, customisation, storage, and eCommerce functions. Well-known website builder, Weebly, also offers a free hosting plan (as well as upgraded plans for premium users). As far as website builders go, Weebly offers loads of professional looking templates to create a modern website without the need for coding skills. Weebly’s free plan will give you 500MB storage, unlimited bandwidth, and a Weebly.com subdomain. Unfortunately, it doesn’t offer any eCommerce features, or an email account. But, you will be able to edit a wealth of free templates using it’s drag and drop features. If you’re feeling adventerous, you can put any HTML or CSS skills you have to use too. Weebly is user friendly for both beginners and professionals, but doesn’t offer as many features as a free web hosting service. Like some other free web hosts, Weebly’s free plan doesn’t have any adverts (thankfully). Though you will notice Weebly branding at the footer of your website which you may want to avoid if you’re looking for a professional website. If you simply want your own personal website or are starting your first blog, Weebly could be a suitable option for you. When you upgrade to one of Weebly’s premium plans, you’ll be able to connect your own domain. You’ll also open up unlimited storage and many more features like Site Search, password protection, video backgrounds and more. Freehostia.com offers free Linux web hosting with no adverts or invasive banners. 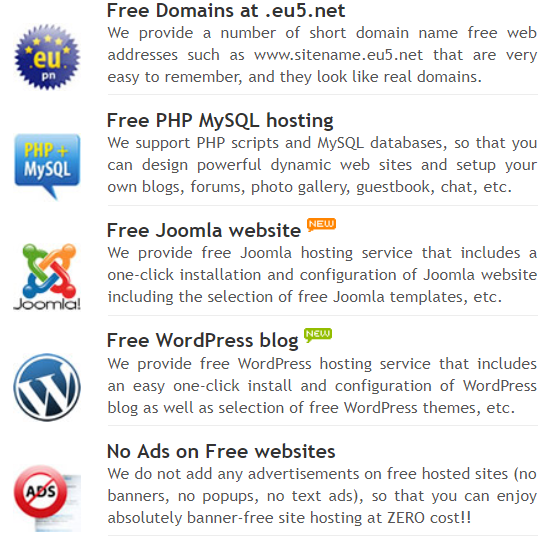 With Freehostia.com you’ll be able to enjoy 1-click installs like WordPress, Joomla, and Drupal at no extra cost. Features include 5 hosted domains and 3 free email accounts which sounds rather tasty (their free plan is named ‘Chocolate’). As well as offering free web hosting, Freehostia.com also offer VPS hosting and dedicated servers. So, if you like Freehostia.com enough, their paid plans may be a consideration. They offer one data center which is located in Chicago, U.S.A. so U.K. users may experience a drop in server loading speeds. Freehostia.com’s free plan includes 5 hosted domains, 250MB disk space, 6GB monthly traffic, 10MB MySQL storage, and a 500KB file size limit. Compared to other free web hosts though, there’s definitely not as much on offer. If you plan to host a website that’s generating a lot of traffic, you’ll probably want to consider another web host. However, for those who are just starting out, Freehostia.com isn’t to be shunned. Users will be offered a free SSL certificate, which is a great start to making your website secure and professional. You’ll also have 24/7 customer support access, and a 1-hour turnaround time on support tickets. When you consider you’re paying nothing for their services, that’s quite generous. freewebhostingarea.com (yes, it’s a bit of a mouthful), offers 14 years of experience in the industry. This web host is aimed at those who are perhaps more technically minded. Their technologies include Apache 2.4, PHP 7.1, and Maria DB, so I wouldn’t suggest this as a beginner friendly option. This web host takes a no frills approach to web hosting, providing a free service with a 99.8% uptime guarantee. You’ll also have daily and weekly backups, 1.5GB disk space, unmetered traffic, MySQL databases, full FTP support, and access to their control panel. freewebhostingarea.com is ran by volunteers, however, they do ask that if you enjoy their services, you upgrade your account to a paid one. They say that small websites won’t ever experience adverts, however, this isn’t guaranteed. You can guarantee this with a small $1 payment on a monthly basis. For me, this web host is directed at more experienced users. If you’re bored of website builders or know you want to experiment a little more, freewebhostingarea.com is a great place to start.